The 36th running of the annual 8 Hour endurance race for lightweight motorcycles on the Formula K circuit at Killarney International Raceway, sponsored by Kaltron Electronics, ASAP and Ryan Kat Racing, was by far the most international yet, with entries from as far afield as Britain, the Netherlands, Sweden, the United States, Mauritius and Reunion. It was, however, also the most drama-filled with spectacular crashes (none of which, fortunately, resulted in injuries sufficiently serious to bring out the ambulance) several periods of intense track maintenance under safety bike conditions, due to problems with the freshly re-surfaced circuit, protests and counter-protests – which were only settled several hours after the race had ended. Even before the race there were concerns about the stability of the newly-laid surface and its lack of grip; it was suggested that the venue be moved to the Half Main circuit, but to preserve the tradition of this long-running event it was decided to go ahead on the Formula K circuit. Pre-race favourites Team RST, having won this race a number of times with their ultra-reliable Honda CBR150, had taken on a new challenge by entering a CBR150 frame powered by a Honda CR85 motocross engine, in an attempt to win the race with a two-stroke, which hadn’t happened since the regulations were amended to include the 150cc four-strokes more than a decade ago. 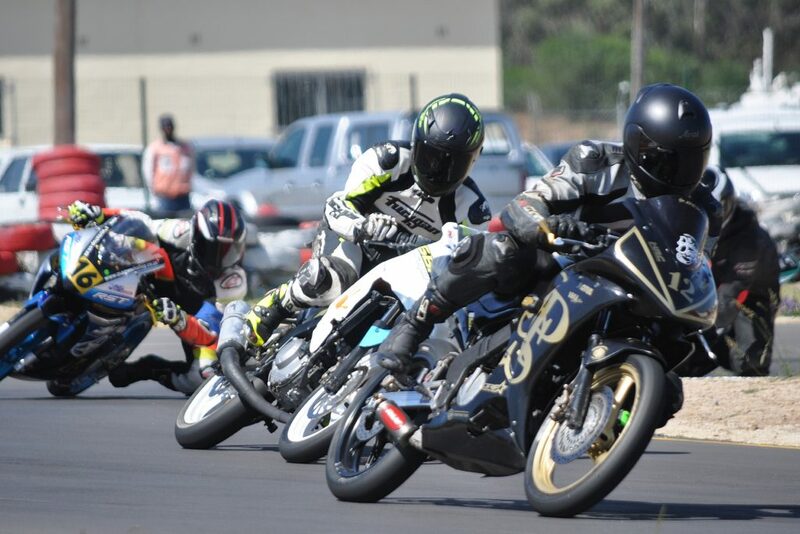 The bike was to be ridden by the ‘dream team’ of RST CEO Jonny Towers, international Superstock racer David McFadden and SA Super300 champion Kewyn Snyman, who had never before ridden a two-stroke but was soon on the pace. The CBR85 certainly had the speed, and ran well throughout a week of intense testing – only to blow its head gasket in warm-up on race day. That was rapidly replaced and the white No.17 machine duly qualified on provisional pole (the only qualifier to break 48 seconds on the slick new surface of the K circuit) but was unable to go out for the top 10 Superpole shoot-out because its clutch had failed. Ten minutes of frantic spannering saw the CBR85 go out for just one incomplete lap, but it wasn’t enough and the team was gridded 10th. 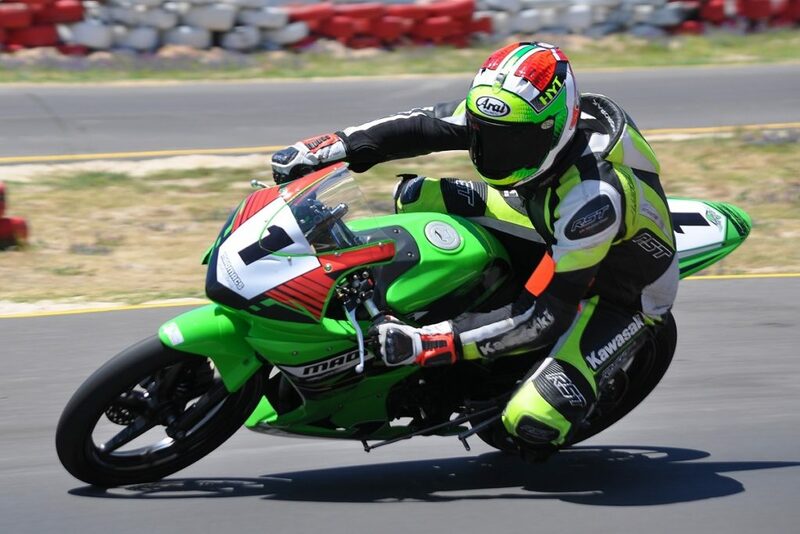 Pole position was taken by the Formula Autos CBR150 of Gareth Gehlig, Brandon Goode and World Supersport rider Dorren Loureiro, ahead of 2017 winners Mad Macs – Trevor Westman, multiple SA Superbike champion Greg Gildenhuys and Wesley Jones, with Powersport king JP Friederich replacing Warren Guantario, who now lives in Australia. Mad Macs also entered a second machine for David Enticott, Rob Cragg, Brandon Storey and Jacques Ackerman. The bikes were entered as Kawasaki 150 Ninjas but that was just to wind up the organisers; under their green livery they were standard Honda CBR150s. Formula Autos and Mad Macs 1 led away from the traditional Le Mans start, with the Mauritian entry of Damien Mompie, Jeffrey Chun Fat Wan and Zafeer Dinally, together with former SA Supersport racer Graeme Green, in hot pursuit. Storey, however got caught out in the first-lap bump and jostle, going down in the third corner, just seconds into the race. The bike landed on his foot, and it took a precious minute – and the aid of a marshal – to get it off him, putting the Mad Macs No.45 squad in the position of having to play catch-up right from the start. McFadden, meanwhile set about slicing through the field to get back on terms with the leaders, which he and Snyman did to such good effect that after the first hour RST were in the lead, having completed 70 laps, with only Formula Autos on the same lap, just three seconds adrift. A crash for Snyman in the second hour, however, cost them time in the pits and led, indirectly, to problems later on. After two hours and 23 minutes the Formula Autos bike had reeled off 165 laps, but Mad Macs 1 had been penalised three laps for overtaking under a yellow flag and were four laps adrift, with the Mauritians a further lap down. However, when the RST CBR85 came in for a routine fuel stop at the beginning of the third hour, its carburettor was overflowing, forcing another visit to the box to clean dirt (presumably from the crash) out of the needle and seat. That dropped the favourites down to eighth, 10 laps adrift, with a mountain to climb. After three hours Formula Autos were on 209 laps, five ahead of Mad Macs 1 and eight ahead of the Mauritians, while the RST squad had clawed their way back to fifth, albeit still 10 laps behind the leaders. By this time the freshly laid surface of the track had begun to crumble on the racing line in several corners, leaving the track surface littered with small stone chips; a 30-minute long safety-bike period was needed for the marshals to sweep the circuit clean enough for safe racing, but a visible depression about two metres long was beginning to form in the Pits Esses, right on the racing line. Minutes after racing resumed, however, the Jannie le Roux/Paul Livings/Jacques Coetzee Yamaha TZR80, went out after a refuelling stop and crashed on the exit from the second 180, spilling petrol from its full tank onto the new tarmac; out came the safety bike again. The marshals mopped up the fuel spill with cement, but when they blew the dust off the track with a power blower, they found they were blowing the tar off as well – it had been liquified by the petrol. Track officials cordoned off the affected portion of the circuit and overtaking was henceforth forbidden in the 180’s. Near the halfway point the No.17 RST bike began losing power, but before Towers, who was aboard at the time, could nurse it to the end of his stint, it seized without warning in the Sweep and spat him off. By the time he’d pushed the bike back to the pits it had cooled down and started easily but Towers was unwilling to put the team at risk of injury from another seizure, so the bike was retired. 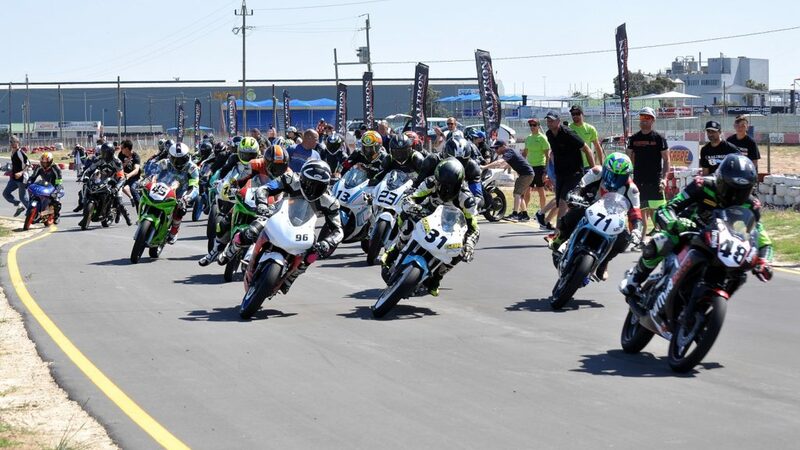 During this hour the Mad Macs riders had clawed back another three laps and Formula Autos had also been hit with a three-lap penalty – with the result that at the halfway point the green machine was leading for the first time one lap ahead. 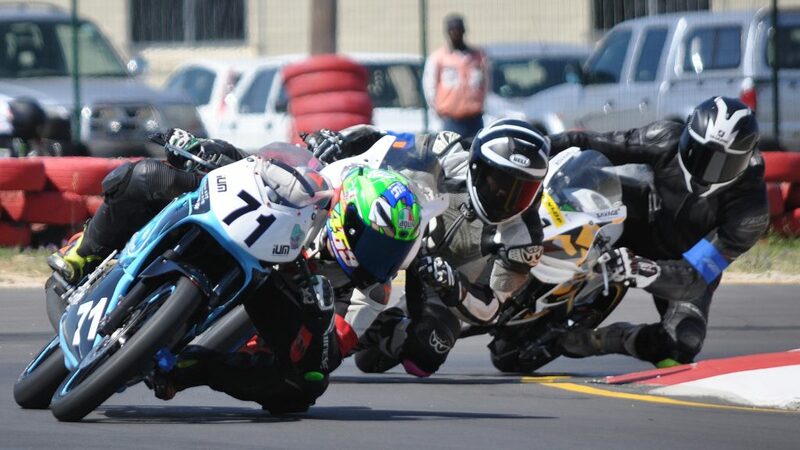 The Otto Racing CBR150 of Chris Wright (the youngest rider in the race at just 13), World Supersport 300 racer Dino Iozzo and Ricardo Otto, had made up three laps3 on the Mauritians and was running third, just three laps behind the leaders. Just after the halfway point HSC Racing’s Abigail Bosson, at 13 years and 39 days the second youngest rider in the race and the only girl, took a huge tumble in the sweep. 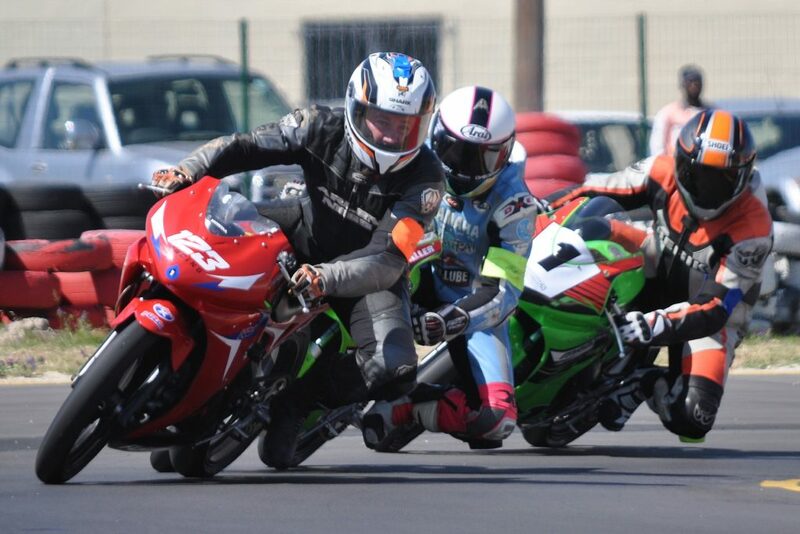 Before the dust had settled, however, she was picking the CBR150 up; one slow lap to check that everything was working and within 90 seconds of the crash this chip-off-the-old-block daughter of the late Chris Bosson was overtaking back markers again! The fifth hour saw another lengthy safety-bike parade as officials inspected the track, and took the decision to replace the barrier between the entry to the 180s and the back straight with a chicane, cutting out about a third of the circuit, including the two worst patches. Amazingly, the deep scar in the Pits Esses appeared to have stabilised, and very little debris was being thrown up by the motorcycles, allowing racing to continue at full steam for the remainder of the eight hours, except when a bike went down at the exit from the Esses during the final hour, throwing some sand onto the circuit and forcing another brief safety-bike period. Seriously wound up, the team began clawing back the deficit. With an hour to go, they had made up two laps and were five laps behind Formula Autos and just one lap adrift of Otto Racing. That set up a cliff-hanger final hour, punctuated by a second spectacular prang for Storey, almost at the start-finish line; he finally brought the Mad Macs 45 machine home eighth. Westman, however, gave up his final stint, sending Jones out to do battle with Formula Autos while he persuaded the clerk of the course to go through the official video footage with him. When it transpired that the incident could not be substantiated by the video evidence the clerk of the course reversed the penalty; suddenly, instead of being eight laps behind Formula Autos, Mad Macs were leading by two laps. Formula Autos immediately counter-protested, not on the merits as the facts were not in dispute, but on procedural grounds. When the chequered flag came down at 6pm and the circuit suddenly became silent after eight hours of unrelenting noise, Mad Macs were credited with 562 laps, and Formula Autos with 560, which was in fact an accurate refection of their performance on the circuit, since each team still had one three-lap penalty on its scorecard. Third was Otto Racing on 556 laps (also, ironically, after one three-lap penalty) with the Mauritians fourth on 549. Even then the drama wasn’t finished, however; the Savage Sixes of SuperGP riders Brent Harran and Bjorn Estment, together with rising local star Connor Hagan, finished fifth on 539 laps, only to be excluded because their CBR150 was underweight. Also excluded was the Trac-Mac TZR85 of Andrew Liebenberg, Tian Terblanche, Juan Liebenberg and Michael du Toit, which weighed in at a heart-breaking 600 grams under the minimum weight limit. Although they’d finished 11th on 495 laps, their disqualification had a major effect on the results, since after the demise of the RST CBR85 their TZR85 was the leading two-stroke, 18 laps ahead of the Dodgy Dozen CBR85 of Damien van Zyl, Ralph Kumbier and Rob Boyd. Thus the Dodgy Dozen, 12th overall of 23 finishers on 477 laps, took the prize for first two-stroke. Another notable result was that of No Rush Racing, consisting of Jimmy Pantony, Gerrit Visser Snr, John Craig (who has raced in every 8 Hour since its inception in 1983) and Paul Medell, with a combined age of 225 years and 110 starts in this event between them. Despite two big crashes for Pantony, costing them time in the box, they came home a creditable ninth on 501 laps. And Bosson? Despite the discomfort of a sprained wrist from her crash, she rode another two full stints, helping HSC Racing team-mates Nicholas and Brad Hutchings and Jarryd Butler (combined ages: 68) to a total of 451 laps and 17th overall. Finally, almost three hours after the end of the race, the stewards dismissed Formula Autos’ counter-protest and Mad Macs were confirmed as the winners of the 36th 8 Hour, the most dramatic and incident-packed running of this event yet. Huge credit is due to the organisers, who kept their cool under extremely difficult circumstances and kept this iconic race running safely for the full eight hours.